Own the court with Babolat Match Core Skort. It features built in compression shorts and external ball pocket, where you can slot a ball comfortably. It is built with stretchy Fiber Dry fabric which keeps you cool and dry, while 360° Motion construction insures you get the best fit for any tennis match. Replacing the Club Line, Babolat's Match Core range delivers top grade technical fabric in understated design, aimed at regular club players. 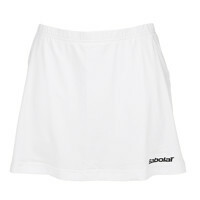 Do you own the Babolat Girls Skort Match Core White?